At the optometric practices of Dr. Chad Lawson, we are pleased to offer a wide range of optical and optometry services for our community. 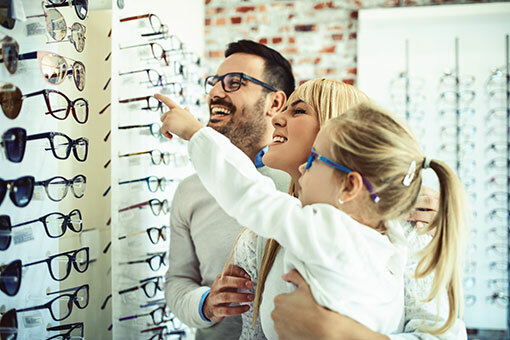 Our professional trained opticians have the experience and knowledge to assist you in selecting the best frame and lenses to suit your vision needs. By taking precise measurements we are able to create custom lenses specific to your vision needs. Both Bethany Optical and Golden Optical offer a wide range of optical and optometry services for every member of our community. From comprehensive eye exams to disease management, Dr. Lawson and his team are here for your individual vision needs. Every person is different and so are your vision needs. We will work with you, to find what frame looks best, which lens is best for your lifestyle and vision needs, and make sure your vision is the best possible. We also offer an in-house finishing lab, so we are able to better serve you by offering some prescription within an hour. We bill most insurances and for those without insurance, we offer discounts on both exam and materials. Our eye exams review the total health of your eye – so you can see the world with acuity and precision. We start with a consultation to discuss your personal and medical history. We then use state-of-the-art instruments to gauge your unique ocular characteristics, finding an exact prescription. We test for degenerative eye conditions and other ailments, ensuring your eyes remain healthy. Our optometrists are your partners in caring for your eyes. We diagnose and treat medical conditions of all sorts, including conjunctivitis, allergic reactions, cataracts, retinopathy, glaucoma, dry eye, computer vision syndrome, diabetes, and sports injuries. A contact lens exam is always done after a comprehensive eye exam is performed to check on your eye health & gather a prescription. Our Daytona Optomap is what gives us the ability to not dilate -the Optomap takes a photo of the back of your eye, giving us a 200 degree view. The Optomap provides us with an amazing comprehensive view to check on your eye health and aids us in detecting eye conditions and other diseases such as cancer, retinal detachment, stroke, heart disease, and diabetes are just the beginning of what this photo allows us to detect.